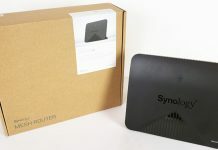 At the Synology 2019 conference in New York City today, the company showed off a product we are extremely excited about. The Synology RS1619+ is the company’s flagship 1U server that is really interesting not because of its NAS focus. Instead, this RackStation is focused on higher-performance applications. The Synology Disk Station Manager (DSM) software has evolved over the years to go beyond traditional NAS storage. It can now host virtual machines, serve as an organizations mail server, transcode surveillance video, act as a domain controller as well as many other functions. As a result, the company is taking its first steps toward making a more traditional server form factor. 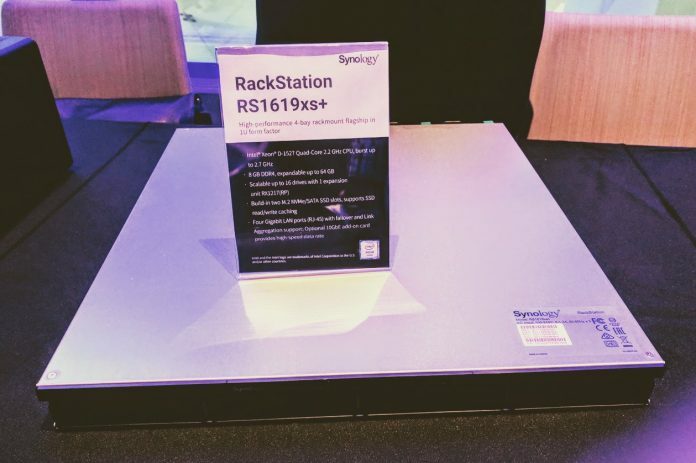 The Synology RS1619xs+ was originally shown at the company’s Computex 2018 showcase. It is still not on the company’s website, but they told the New York City crowd that it was a new product, so we expect more info soon. It was shown alongside the company’s new MR2200ac mesh Wi-Fi solution and the new DS1819+ 8-bay desktop NAS. Key here is that the unit sports an Intel Xeon D-1527 quad-core 2.2GHz CPU. The system has 8GB of RAM and is expandable to 64GB. We also saw that the server supports two M.2 NVMe/ SATA SSD slots for read/ write caching. This is one of the first NVMe enabled Synology units. On the networking side, there are four 1GbE ports and an expansion port for 10GbE. We would have liked to see 10GbE standard in this class of product. That aside, we hope Synology realizes what it has here. For those in the Synology ecosystem, this is a complete server platform that in some ways will offer an alternative to Windows. Synology, coming from its NAS roots, generally adds CPU power alongside more drive bays. This is the first 1U “xs+” platform and one that has only 4x 3.5″ drive bays. We think Synology is absolutely on the right track with this. Adding perhaps the next-generation Intel Xeon E-2100 8-core CPUs and 10GbE as standard would transform the server into a true powerhouse ready to be a Windows Server or VMware replacement for many organizations. Synology DSM is ready to get some hardware for organizations who do not necessarily need just file services but instead want to use it for server applications. If Synology wants to grow a hundred million dollar or more line, it needs to start producing better hardware options for utilizing DSM in non-storage capacities. 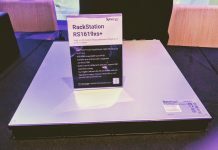 The Synology RS1619xs+ is a step in that direction. It blows my mind that Synology refuse to integrate 10GbE into products using SoCs that have built in 10GbE MACs. Especially on a box like this one, which is a pair of SFP+ sockets away from being a perfect baby SMB server (as mentioned). QNAP are including 10GbE in some of their cheapest units, but Synology are still hellbent on selling you a several-hundred-dollar add-in card that uses up the only available expansion slot! Synology has nice software, but the hardware is underpowered compared to the competition. 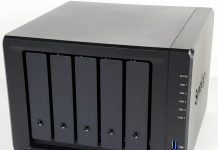 If Synology simply put their software on a Supermicro single socket EPYC, Xeon Silver or Gold, or even Xeon D-2100 series server, add $500 for DSM, and they’d have a huge winner. Cliff is right that this is a good direction but a D-1527 with 64GB max isn’t good enough. If you want to do virtualization, you’re going to want more cores and RAM. Samuel: They have higher-end boxes with single or dual socket E5-2600 setups, like the FS3017 (which is likely to be upgraded/replaced in the not-too-distant future); this is the higher-end 4-bay unit of their “Plus” series, which is aimed at low-end SMB setups. a D-1527 with 32 or 64GB of RAM will quite happily run a DC VM, a small TS VM, and one or two application server VMs (especially if they’re Linux or Server 2016/2019 in Server Core mode) without much fuss – think a typical Server 2016 Essentials setup, for example. It’s roughly equivalent to a Dell R230 and that’s more than enough for 10-20 users. Think of it as a NAS that can handle lightweight server duties, since that’s what it is, and it makes a lot more sense. Using up the only PCIe slot for 10GbE doesn’t. It’s probably only a matter of time before you can license DSM onto whatever hardware you want to use, though. I would buy a rack mount synology if they offered better hardware support, such as next day replacement or after warrenty repair support, but they don’t. Sadly they were built around to server the consumer and not businesses that can handle downtime. Having good support is a must, that includes hardware support.